As you can see in the image at the top of the page…. there are two large ‘PVC’ pipes leaning up against our shipping containers. These are big and heavy pipes that are about 200mm in diameter and both are over 2 metres long. We picked them up for free and will use them in an engineering project in the near future. Meanwhile they have been stored here… leaning against the container. The container on the left contains our Upright Freezer, our 5 worm farms and a plethora of other garden bits and pieces. Because of the worm farms we occasionally get rats moving into the container. Sometimes we see them, sometimes we smell them… but either way we reset the traps and attempt to remove them. Shionagh came to me a week or so ago and said the container was starting to “stink” – a sort of rat urine smell. So we investigated and found nothing of consequence, but planned to do some rat control the following day. Just a day or two later Shionagh again called me out the containers. This time the issue was flies and a really bad ‘death’ smell. What we saw was a mass of flies surrounding the bottom of one of the pipes, and a black ooze coming from the bottom of the pipe. It was clear something was dead in the pipe. I climbed up on top of the container and could see that something ‘animal’ was in the bottom of the pipe. We lifted the pipe from the ground and the black mass slide out. It was a poor possum that was well past it’s use by date. Our assumption is that he investigated the pipe, but then could not get out again. No problem… Dead possum in the bin, and clean up a bit and all is good. Shionagh again calls me to the container. She’d just seen a smallish Goanna running from the eatern contaner and there was this strange noise coming from near the eastern container…. sort of like a scraping noise. 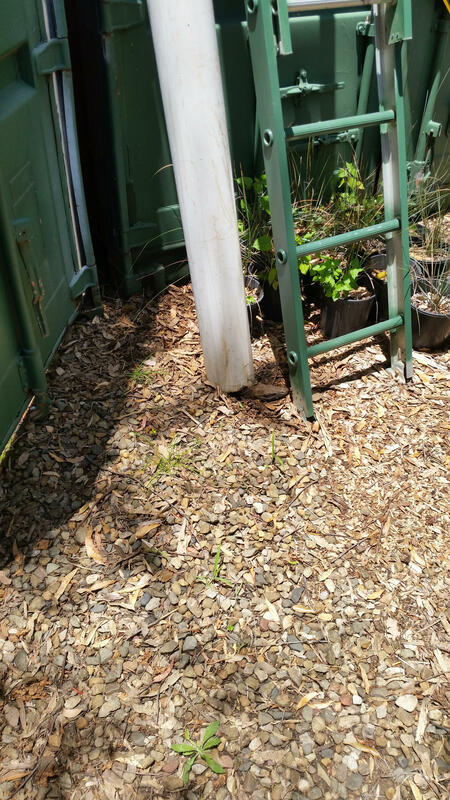 As we approached the containers(and pipes) we could see the smaller Goanna had taken off into one of our Ponytail palm trees. We could also hear the weird noise and it was then that I spotted something sticking out of the bottom of the pipe again! I was really hoping whatever it was, was still alive and kicking. 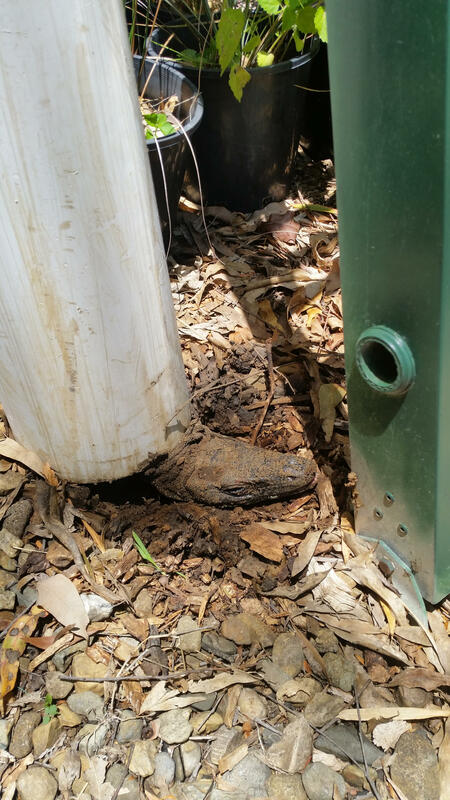 Just sticking out of the bottom of the pipe – that was still sitting up vertically against the container – was the head of what looked like a rather large Goanna. You can see her head in the pictures. So now we needed to extricate the Goanna from the pipe safely. That’s safely for the Goanna… but also safely for us. These guys have big claws. I climbed up onto the containers again, and again grabbed the big pipe from the top. We could clearly see the big Goanna caught vertically in the pipe. 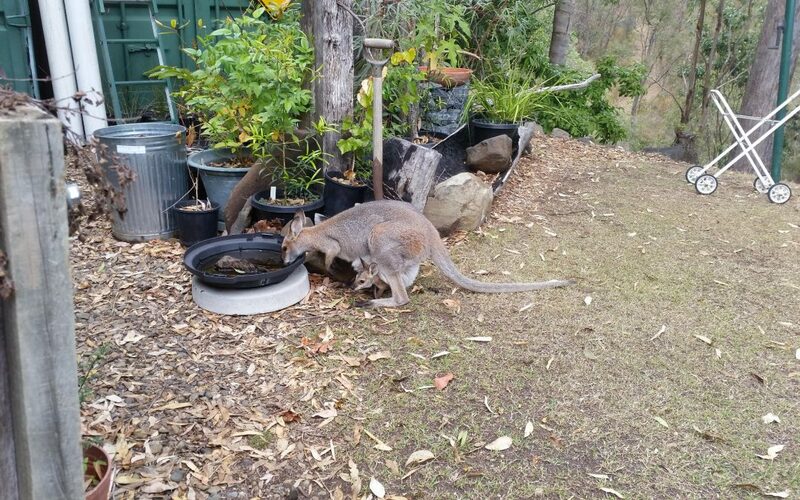 I lifted the pipe….. and about a metre off the ground a big fat Goanna slipped out of the pipe, turned on her tail and disappeared under the containers. Our guess is that the Goanna was chasing the smell of the dead possum and had entered the pipe at the top and slid down. As she had tried to dig herself out(Goannas are great diggers), the pipe had slid into the hole she was diggin and trapped her head against the ground. We can only hope that she was not there for too long. You can see in the video below that she was not too perturbed and simply walked away. We now keep the pipes on the ground and clear of any obstruction.